When working with these features in Populi, make sure you're familiar with the relevant sections of the Federal Student Aid Handbook (PDF Link). You set up an SAP Policy. Each policy covers all of the students in a given academic program and has particular requirements for GPA and Term Units Granted. SAP Policies are automatically applied to enrolled students. At the end of a given academic term (or, for continuous enrollment programs, a payment period—see below) when courses are finalized, each student's SAP is calculated according to their program's policy. The results are available on student profiles (in the Financial Aid view) and in Financial Aid > Reporting > Academic Progress. Click Add an SAP Policy. Select a program. This policy will cover all students enrolled in this program. You can have only one policy per program. Enter the minimum GPAs and Units granted for a student to meet the policy's requirements. AY2, PP2, and PP3 are official, Federal review actions. Immediate Suspension and Warning only are provided to fit your own internal aid review processes. No automated actions are connected to these review actions; they are simply for information purposes. Once you add the SAP Policy, it will immediately apply to all students enrolled in that program. Read more below. Payment periods let you calculate SAP for students in continuous enrollment programs. You create them at the program level in Academics > Programs. You will need someone with the Academic Admin role to set them up. You can set up payment periods only after you've set up at least one SAP policy. In Academics > Programs, either add a new program or select an existing one and click edit next to Info. Check next to Continuous Enrollment. When you do that, the Payment Period field will appear. Academic term calculates SAP at the end of a term for the student's finalized courses. Manual lets you create custom payment periods for the student on Profile > Financial Aid. SAP is then calculated at the end of the payment period. If you are integrating Populi Financial Aid with third-party financial aid software via our API or with regular financial aid data imports, use this setting. 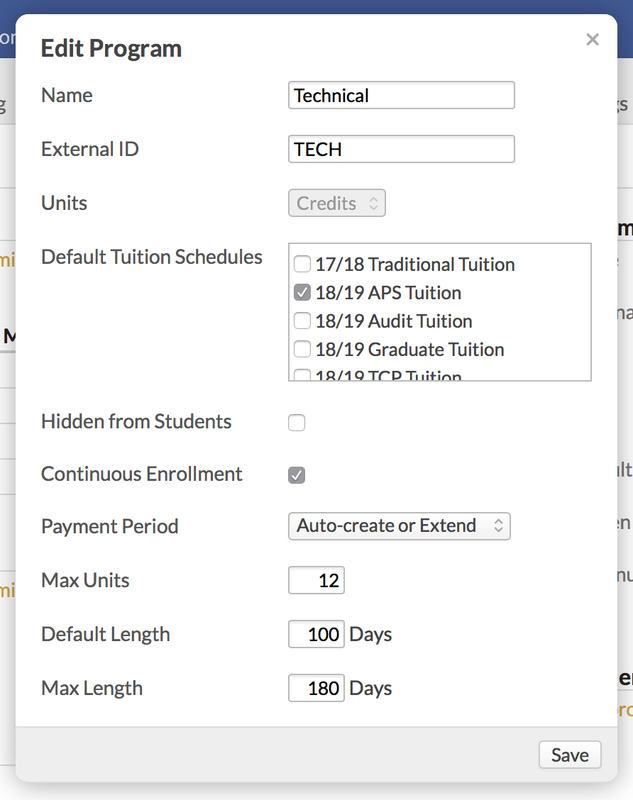 Auto-create adds a new payment period to a student based on a course start date. The payment period is limited by the default length and maximum number of academic units for which the student enrolls. Auto-create and extend automatically extends a student's payment period up to a maximum number of days and academic units. Enter values for Default Length, Max Length, and Max Units (you'll have different options depending on the payment period type you choose). In the following examples, the "Technical" program's payment period has a Default Length of 100 days and a Max Units of 10. We'll be looking at how the two Auto-create payment period types work. New student John Daniels enrolls in your Technical program. He enrolls in a 4-credit course that runs from February 1 - 20. Both types will automatically create a 100-day payment period for John that runs from February 1 to May 11. John enrolls in another 4-credit course (for 8 total credits in the payment period) that runs from March 5 - 25. Both types will map this course into the payment period established in the previous step. John enrolls in a 2-credit course (bringing his total credits to 10) that runs from May 1 - 20. Auto-create sees that the course dates will not fit into the payment period created in step 1. It creates a new, 100-day payment period running from May 1 to August 8. Auto-create and extend sees that the course dates will not fit into the 100-day default length (its Max Length is 150 days). It extends the payment period created in step 1 to May 20 to include the course. Alternately, let's say that John enrolls in a 4-credit course that runs from May 1 - 20; this brings his total credits to 12. Since the 12 credits exceeds the Max Units of 10 for both types, both payment period types will create a new, 100-day payment period running from May 1 to August 8. As soon as you create an SAP Policy, it will immediately apply to all students enrolled in that program who enroll in a course. As each student's SAP is calculated, you can find it on his Profile > Financial Aid > Financial Aid view. If you need to set it manually (or change the automatic status), you can do so there (see below). Financial Aid > Reporting > Academic Progress includes a column for SAP status. The column will remain empty for a student until his SAP status is calculated. If you create custom payment periods for continuous-enrollment programs, those will automatically be used to calculate SAP for students enrolled in those programs. 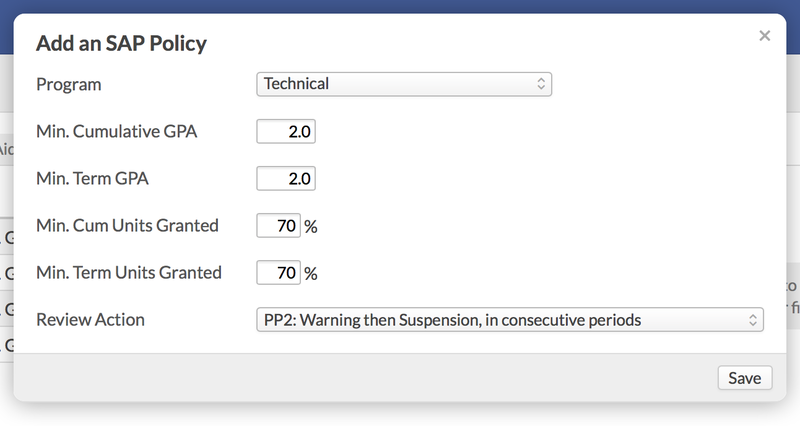 Here's how to manually override SAP status for a student. Go to the student's Profile > Financial > Financial Aid view. In the right column, you'll find his SAP status listed by term. Click the SAP status for the term you'd like to change.